In its quarterly Mobility Index, secure enterprise mobility solutions firm Good Technology on Thursday reported iOS accounted for 73 percent of enterprise device activations for the quarter ending in December, while Google's Android platform slumped to 25 percent share of activations. The results compare to the quarter prior, when iOS and Android boasted device activation shares of 69 percent and 29 percent, respectively. Microsoft's Windows Phone and Surface eked out a one percent market share in total device activations for the most recent quarter. Good attributes Apple's market share gains to the iPhone 6 and iPhone 6 Plus, which were introduced in September and subsequently buoyed enterprise activations into quarter four. Combined, Apple's latest handset offerings accounted for 30 percent of all tracked device activations. Device adoption varied from industry to industry, but iOS outperformed Android in regulated sectors where security is a top priority. Apple products accounted for 95 percent of devices in the legal industry, 82 percent in the public sector and 81 percent in financial services. 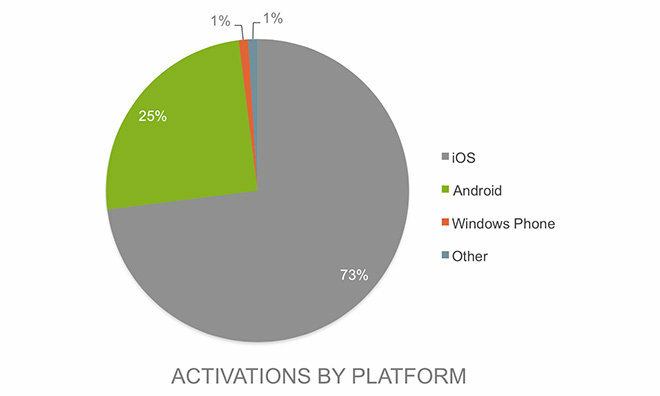 Good believes Android fragmentation and perceived security issues are slowing adoption. As of December, Android ranked above average in less restricted industries like high tech, manufacturing and transportation, but failed to dominate any one business sector. Earlier this month, Good and Samsung announced a secure app container and software ecosystem dubbed "Good or Samsung KNOX," a solution aimed at boosting adoption rates in regulated industries. Interestingly, the study found smaller form factors more popular than larger "phablet" smartphones. For the iPhone 6 series, the 4.7-inch model was favored over the 5.5-inch version more than three-to-one. That trend could be in flux, however, as the quarter prior saw 85 percent of iPhone 6 users choose the smaller-screened model, potentially due to iPhone 6 Plus supply constraints. Android users, too, preferred smaller devices, with Samsung's S4 Mini outpacing the Galaxy S4 and Galaxy S5 device families. Unsurprisingly, Samsung lead the charge for Android and took nine of the top ten spots for devices running Google's mobile platform. Other key findings from today's report include a whopping 900 percent increase in secure instant message activations over the course of 2014, while secure browser deployments grew ten times from the same time in 2013 and represent 27 percent of all apps deployed by businesses. Custom app usage also continued to increase at the end of 2014. 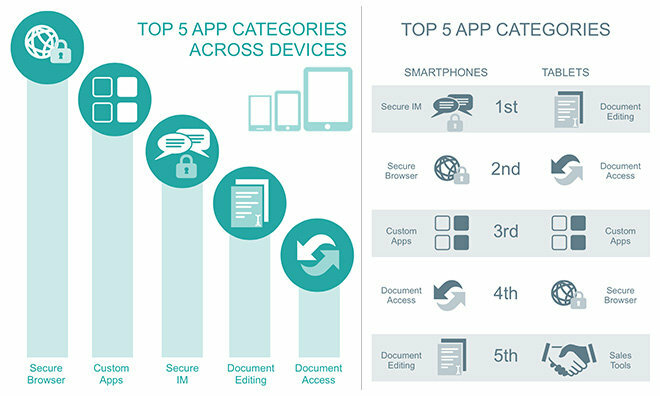 Secure messaging and Web browsing were the two top app categories for smartphones, while most tablet owners used their devices for document editing and access. Good Technology's study was based on aggregated internal data from the company's global customer base, which now includes more than 6,200 organizations around the world. Since Good lacks insight into BlackBerry's Enterprise Server, the firm omits BlackBerry devices from the quarterly report.